The Bells were installed at St. Giles during 2012. The band of St. Giles ringers, all novices when we started in October 2011, practised under the guidance of experienced local ringers. We ring each Sunday morning from 9.30 to 10.00am and for one Sunday evening Service per month, usually after a Sunday afternoon ringing practice. See also Installing the St. Giles Bells. One extent each of Ipswich, Bourne, Norwich, Beverley, Surfleet, Cambridge S and Kent TB. One extent each of Buxton & St Clements, two extents of Kent TB and three extents of Plain Bob. In the morning the bells were rung between 9:20 and 10:00 with, unusually, all seven bells being rung together. In the afternoon there was a special peal with the bells rung open to celebrate the 100th Anniversary of the Armistice. .
1 extent of Stedman, 9 extents of Grandsire and 8 extents each of Reverse Canterbury, St Simon’s, St Martin’s and Plain Bob Doubles. front right, treble to tenor. Anyone who was in the vicinity of St Giles on Tuesday, 31st July, might have thought the bells had malfunctioned and gone into overdrive! The reason was that they were, err, going like the clappers! This was no accident and no malfunction but a deliberate attempt by the ringers to post the fastest quarter peal on the bells. Whilst the ringers can, to a degree, influence the speed of ringing, it can also be dependant on the type and complexity of method (tune) and also the weight of the bells. The lighter the bells the quicker they generally ring and, at two and a half hundredweight, the tenor at St Giles is lighter than most. Normally a quarter peal of Minor (all six bells interchanging) at St Giles takes about 36/37 minutes whilst Doubles ringing (five bells interchanging with the tenor always ringing last in sixth position) can be a minute or two quicker. We therefore decided to ring a quarter peal of a straightforward Doubles method and make a determined effort to ring as fast as possible. Some of our ringing friends at Kemsing where the tenor of the six bells is four hundredweight had, a few years ago, rung a quarter peal of Doubles in 28 minutes and this, therefore, was our target. Further, their Tower Captain had a birthday at the end of July so we thought we’d try to ring a quick quarter peal as a birthday compliment. For our attempt we chose a simple method, Plain Bob Doubles, and went absolutely flat out. We put a digital clock in the ringing chamber and finished in 25 minutes! It was hard work and we were delighted with the achievement but we prefer to ring at our usual, slightly slower, pace. Fastest QP on the bells and a birthday compliment to Fraser Clift, Tower Captain at Kemsing. We rang seven different methods ( ‘tunes’ to the layman ) starting with Bourne Surprise Minor and ending with Plain Bob Minor. Each method took about 20 minutes, thus giving the total time of 2 hours and 20 minutes of non stop ringing, to achieve the total of 5040 changes. We ring the full number of different combinations of changes of each method and this is 720, or factorial 6!, being 6x5x4x3x2x1. Ringers generally love our easy to ring, new, light bells and happily travel to Farnborough, these ringers coming from different locations in Surrey and Maidstone. A peal is the name given to a specific type of performance of change ringers. The precise definition of a peal has changed considerably over the years. Currently, for a performance to be recognised as a peal by the Central Council for Church Bell Ringers it must consist of sufficient changes (at least 5040 changes on up to seven working bells or 5000 changes on higher numbers), meet a number of other criteria (collectively referred to as the decisions), and be published in The Ringing World. On typical tower bells a peal takes around three hours to ring; the precise length depends on factors including the exact number of changes and the weight of the bells. At St. Giles the duration is customarily a bit less than this due to the light weight of the bells. Normally bells are rung down the scale from the lightest (treble) to heaviest (tenor) and this is known as ‘rounds’, and can be written down as 1 (treble) 2 3 4 5 6 (tenor). We have six bells that we ring down the scale at Farnborough ignoring the clock bell and service/funeral bell. When ringing we have regard to the number of the bell, not its note. Ringing usually starts and ends with rounds and the first variations of this are known as call changes, where the conductor calls a change such as 3 to 1, which means bell three follows bell one and the order becomes 1 3 2 4 5 6. The next call could be 5 to 2, giving rise to 1 3 2 5 4 6. A further call of 5 to 3 would bring up the musical change of 1 3 5 2 4 6. This means the odd bells ring first and then the even bells and this change is known as ‘Queens’. The 2-2-26 in E indicates the weight of the tenor bell (2cwts, 2qtrs and 26lbs) and it’s note, E.
On Remembrance Sunday 2018 an appropriate number of call changes was 100, being the centenary of the end of WW1. ‘Half Muffled’ means that every other sound of the bell is muffled. This is achieved by fixing a leather muffle to one side only of the clapper of each bell so that when the bell swings in one direction it sounds normal (or ‘open’) and when the bell swings in the other direction the side of the clapper that has the leather muffle on it hits the sound bow of the bell and the resultant sound is reduced/muffled. After morning half muffled ringing on Remembrance Sunday we rang a full peal starting about 12.30pm with the bells ‘open’ (ie not half muffled) to celebrate the centenary of the end of WW1. This took 2hrs 27 minutes of non stop ringing and took place while the church was open for the Flower Festival. In the case of more advanced ringing we don’t call changes but ring ‘methods’ which, to the layman, could be described as tunes. These methods are known by heart by the ringers and some of the most common ones are those we rang in the peal. They were Kent Treble Bob, Cambridge Surprise, Plain Bob and St Clements College Bob Minor. Minor denotes that the methods were the six bell varieties. To ring a full peal on six bells we have to ring 5040 ‘changes’. The first ‘change’ with any of the four above mentioned methods would be 2 1 4 3 6 5 but then there’s a divergence between the methods. In each of these methods we ring all the possible combination on six bells, which is factorial six. It can be written 6! and those with mathematical knowledge will realise it’s 1x2x3x4x5x6. That comes to 720 changes or different combinations on six bells. So we had to ring seven extents to get to 5040 changes. Why 5040 changes? Well, one of the most common number of bells in English church towers is eight and historically often methods were rung with seven bells interchanging and the eighth one, the tenor, ringing last. That gives a good structure to the ringing and is pleasing to the ear with the tenor ringing at the end of the change. Guess what...the maximum combination on seven bells is factorial seven and is factorial six (720) times seven which is 5040! This number of changes is adopted even for peals on less than seven bells, such as our six bells at St Giles. On Saturday afternoon, 17th November 2018 St Giles hosted the Lewisham District Call Change Competition. As District Ringing Master it is my responsibility to arrange a tower to host this annual competition as well as judges who listen carefully to the ringing, marking faults when each of the bands rings, and then delivering the results. 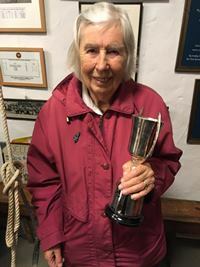 Five bands from different towers entered and each had the aim of achieving even and rhythmic ringing with minimal clips or clashes as the bells rang. The rules require each band to ring 120 rows and within this to have 12 changes. This level of competition, in musical terms, is the equivalent of being assessed on one’s scales on the piano or organ rather than, say Widor’s Toccata! It is a slight advantage to be the host tower as the home bands know the bells and their idiosyncrasies although we did allow representatives from other towers to come to St Giles to practise in the run up to the competition. After the five bands had rung there seemed an interminable wait before the judges announced the results. In time honoured fashion these were announced in reverse order and, yes, St Giles was placed first! Second was Bromley and Crayford was third. We boasted the youngest (Helen Scarlett) and oldest (Audrey Allaway) ringers with 75 years age difference! The photograph above shows Audrey holding the cup and we think we might now need a trophy cabinet...!